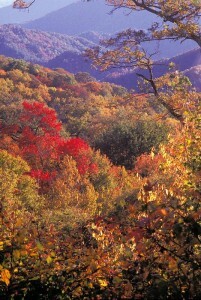 HomeHome /	/ Blog / Smoky Mountains / Top 3 Places to View Fall Colors Right Now! Top 3 Places to View Fall Colors Right Now! It’s mid-October 2013 in the Smoky Mountains around Gatlinburg and Pigeon Forge, Tennessee, and the leaves on the trees are getting ready to dazzle us with their world-famous Fall colors. Here are the 3 of the best places to view it all right now! The high country is the first to start the change and it’s been underway for a couple of weeks, accelerating in the last few days. This weekend begins the peak saturation of the yellows, oranges and reds currently on vivid display along the mountain tops. Next weekend at the highest elevations the leaves will begin to fall. Catch the colors now before they go! Take a drive south of Gatlinburg on Newfound Gap Road, US441, into Great Smoky Mountains National Park, now completely re-opened following the federal shutdown. Make a preliminary stop if needed just inside the Park at Sugarlands Visitor Center for maps and information. Drive to Newfound Gap Overlook. US 441 through the Park is a spectacular scenic roadway and crosses the border from Tennessee into North Carolina here at the highest point of Newfound Gap Road. This point 15.5 miles along the scenic route affords unsurpassed views of both states as far as the eye can see. Drive to Clingmans Dome. This is the highest point in the Park. Depending on visibility, 7 states can be seen from this observation point. Turn off Newfound Gap Road 0.1 mile south of Newfound Gap and follow the 7-mile-long Clingmans Dome Road to the large parking area at the end. When you get to the large parking lot, it’s a half-mile walk along the path to get to the observation tower. Here’s the Park Service Clingmans Dome page for more information. Hike to Inspiration Point on Alum Cave Trail. This is actually the first stop on the itinerary, 10.5 miles south of Gatlinburg. Consider making the hike if you feel comfortable with your clothing, footwear and physical ability.The hike is 1.8 miles in EACH direction, there and back. It’s called a moderate hike, a fairly gentle climb. It’s very interesting all the way, through a rich old-growth forest with great views of the surrounding mountains. You can also go further than the Point on this trail if you want, but only if you’re up for a difficult hike: here’s a detailed description. 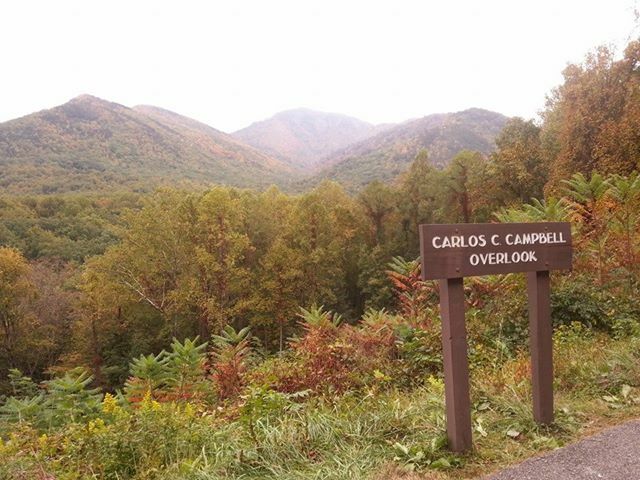 Carlos Camppbell Overlook. If you’re short on time, you can bail out early on this trip just 2-3 miles along Newfound Gap Road. The Campbell Overlook has one of the best vistas in the Park, and perhaps the very best view for the minimal effort involved of Mt. LeConte. This place is worth a stop in its own right whenever you have time. Temperatures at the Gap and the Dome can be 10-20 degrees cooler than in the surrounding lowlands. Clingmans Dome is actually a coniferous rainforest. Plan on needing more clothing than you did where you started from. Dress in layers and have a jacket with you. Also, take a camera – and then post your best picture on the Cabins of the Smoky Mountains Facebook page so we can share with the world!